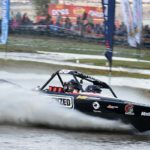 With Wairarapa’s second round of the Altherm Jetsprint championship cancelled after insufficient water in the region, Whanganui has become round two of the six-round series. It’s set to be a high-powered event, with the world’s fastest jetsprint racers taking to the road on Christmas day to converge on the riverside town. Defending Mouthfresh SuperBoat champion Peter Caughey says there’ll be a big field on track, with 42 drivers across the classes and 14 of the methanol-fuelled SuperBoats. While the racers don’t get to see the sequence of corners they’ll need to memorise until a few days before the event, the promoter – Richard Murray – could find the home-town home-track advantage helps him to wrestle his ex Hulk supercharged monster round in a quick time, too. The event organisers have pushed the race start back two hours, with racing expected to finish around 7pm, just short of that dangerous ‘sunstrike’hour. While Caughey and his wife, Karyn, will drive the rig and the crew equipment up, the rest of the six-person team will fly through on Boxing day, to give them time with their families, though like the other drivers, Caughey’s own family have got used to celebrating the day early. But Caughey already has his focus on the remaining five rounds – the Wairarapa round having dropped, an extra round has been fixed for New Plymouth’s Methanex Aquatrack on Saturday, April 14.